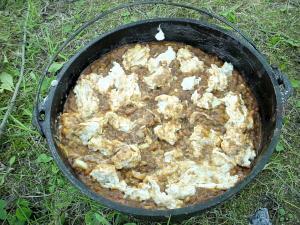 Heat dutch oven to 325 for Frying. 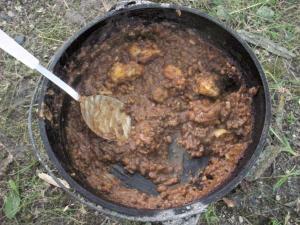 Brown the hamburger in the dutch oven. Stir in ketchup and mustard. Cover and Bake on low heat (275 degrees) for 15 minutes. While baking, prepare the Bisquick mix to make a dozen biscuits. Stir the burgers and beans. Cover the top of the bean mixture with the biscuits, completely covering the top. Sprinkle the cheese over the entire top of the biscuits. Bake covered for 30 minutes, until the biscuits are done. Let me know how you enjoyed your Burger, Beans, & Biscuits! we will be incorporating your recipe's in our menus for future camps. thanks and keep up the great work.